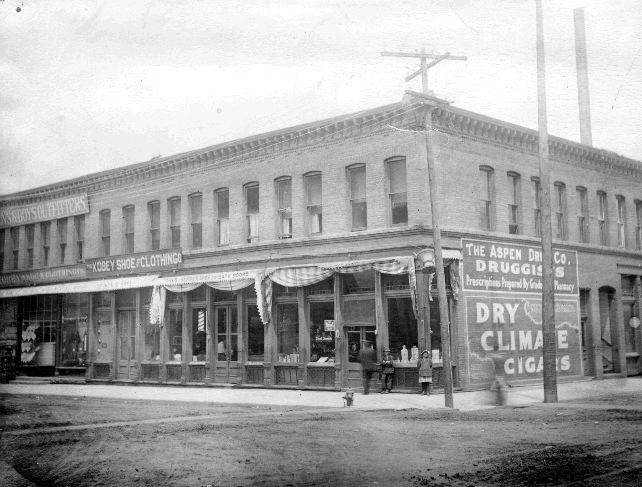 The Aspen Drug Store (see 1905) was located for more than 100 years at the corner of Hyman Avenue and Galena Street. There were several pharmacies in business (see 1905) in Aspen at the turn of the century, before pharmacists and medicines were licensed. Aspen Historical Society photo. The Midland train as it pulled into the depot yesterday was surely a clipper, and several who stood on the platform wondered if the long line of cars would never come to an end. It was a double-header and between the two engines were twenty-nine cars, some loaded, but mostly empties to ship large quantities of ore out of the city.However, reading between the lines in occasional articles was the record of hard times in 1905 Aspen.It was learned yesterday that a holdup had occurred early Wednesday evening near the Koch sawmill on Castle creek. It appears that one of the employees of Sterners ranch, who had been in town and was on his road home, going out the railroad track, was ordered to hold up his hands near the sawmill by two men. He was taken so unawares he did so at once and the men secured ten dollars and a silver watch which he carried. They told him to continue on his way, which he did as fast as he could. The man’s name could not be learned yesterday. The affair is being investigated. The Aspen Times announced some spring maintenance for Highway 82 (see photo), Aspen’s link to the rest of Colorado.There’s good news for Aspen in the announcement this week of the Highway Department decision to do some work on the Highway 82 above Aspen. Frederic T. McLaughlin, representative to the state assembly, called Assessor Warren Connor Tuesday morning and said that the Highway Department had assured him that plans were now included in the highway projects for the new fiscal year beginning July 1, to surface from 2 to 3 miles of the highway immediately above Aspen on the pass road. …In addition to the grading and surfacing above Aspen, the highway between Aspen and Basalt will be repaired. The heavy amount of frost in the ground this winter has caused numerous breaks in the surface of the highway and some pretty bad holes have opened up during the past month. The repair work must be done to save the road. …This is also a start on improving and surfacing the entire route 82 from Aspen to Twin lakes. Highway 82 is already surfaced from the junction with 24 to Twin lakes, a distance of seven miles. Any mileage paved will be a nice start towards getting this scenic drive, and one of the most popular drives in the state, finally surfaced its entire length.The troops stationed in 1955 at Camp Hale were not named the 10th Mountain Division, according to this article.The Mountain and Cold Weather Training Command has scheduled a cross country ski march [see photo] from Camp Hale to Aspen.The five officers and 50 enlisted men left Camp Hale last Monday morning by truck to Malta and thence up Half Moon Creek Valley where they bivouacked.On Tuesday the troops moved from Half Moon valley to the south side of Independence Pass, a distance of 4 and one-half miles.On Wednesday, the group moved down the west side of Independence Pass to Lost Man where they stayed overnight. Thursday they moved on down Independence Pass road (not plowed out) to meet the buses about 4 miles southeast of Aspen.The mission of the group is to permit practical usage of individual cold weather clothing and equipment and application of survival techniques, during a mountain movement and an overnight bivouac without tentage and space heaters under conditions of snow and extreme cold.Charles Paterson is one of the members of this group and has been assigned to the reconnaissance squad that will make several side trips along the main line of march. Charlie expects to be in Aspen for dinner Thursday evening. Regarding the capricious March weather in the Rockies, “Around Aspen” commented,Many disparaging remarks have been heard concerning our March weather. Perhaps a few words from an original Aspenite will clarify the situation. As expressed by Mr. Floyd Callahan: You can expect most anything in the month of March. One time years ago it snowed 5 feet in 5 days, coming straight down in a continuous blanket and all the population did little else but shovel snow. With the spring thaw (see photo) is revealed what we’d rather not see and what we no longer see. The paper noted,Nearly 20 of the large trash cans on Aspen’s street corners have mysteriously disappeared during the winter.According to “the late great Captain Clean,” who resigned this week, the cans cost $50 each to replace. He considers the thefts “a waste of taxpayers’ money.”The kindergarten school day was a topic for discussion 25 years ago, as it still is today. The paper reported,Still undergoing changes is the kindergarten of the Aspen Public Schools which two years ago went from two and a half hour morning program to a full day program. …[Elementary school principal Barbara] Truan said about seven children have been attending kindergarten for a half day while the other 50 students are going to kindergarten the full day. Truan assessed what happened the first year of the change.”It appeared to be a long day for the children. Many were tired and listless. The teachers philosophically were not ready.” …Truan explained what has happened this year. “Teachers’ attitudes have changed,” she said. “They are no longer resisting change … they feel it is their responsibility to offer the best program possible. They are more relaxed.”What to do with Smuggler Mountain? A question for the county in 1980 and a question in 2005. Brian Stafford, assistant county manager, this week completed a lease amendment proposal for 907 acres of land on Smuggler Mountain north of Aspen.The county leased the land from the BLM several years ago, anxious to maintain it as open space.The terms of that lease, however, were ambitious and impractical. The county could not do all the improvements it agreed to. As a result, it stands a chance of losing the lease now.Stafford, in the amendment, proposes several deletions from the original lease. Among them would be improving two miles of road for 10 years, clearing 3.6 miles of horse and foot trails, building four campsites with fireplace, toilet, table and water supply.It is proposed that the Smuggler Mountain jeep road be kept available for public use under a controlled access system.Only one access would be available (there are now two) to the jeep road, and there would be a gate.The amended lease proposal includes three and one-quarter miles of foot trails.One of about a half mile would go from the base area near Midland Park to the Aspen Grove subdivision. This is already included as a proposed trail in the adopted Pitkin County Trails Master Plan.Benches would be constructed at a few key points and the trail would connect with the proposed Salvation Ditch/Silverking paved bike trail.A second trail would head toward the Difficult Campground area and parallel the Highway 82 bike trail.The third trail goes up Smuggler to the top and Warren Lake, where it connects with Continental Divide trails.The BLM/Smuggler property may become a part of the White River National Forest if House Bill 1967 is passed.